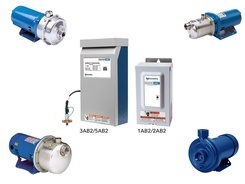 Goulds Pumps Aqua Boost II Controller/Booster System - The AquaBoost II variable speed pump controller and complete booster package kits, provide an economical answer for municipal water district customers with low water pressure. Both domestic and light commercial applications can benefit. As water use increases, the AquaBoost II changes pump speed to maintain pressure. Large supply tanks are eliminated and less wear and tear on your pump and motor.